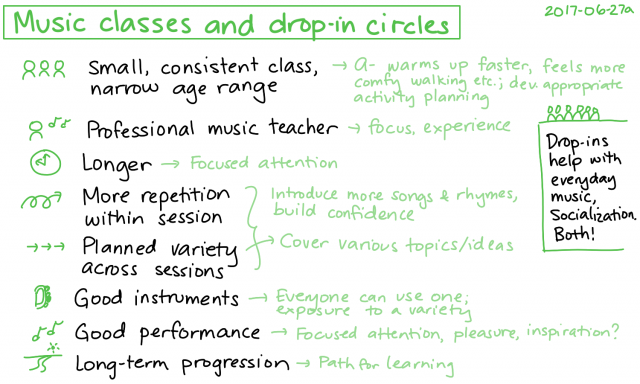 I like taking A- to music classes and circle times. I learn more songs and A- gets to see other kids in a semi-structured environment. A- usually clings to me, preferring to quietly watch instead of joining in. She’s not keen on tickling games. She tends to get anxious when the teacher or family support worker uses puppets. In last year’s music class, there were maybe a couple of sessions when she felt confident enough to walk and jump on her own, but that was after months of being carried, and she still often chose to be carried after that. At home, though, she loves arranging chairs, singing songs, and exploring instruments. I think it’s totally worth it and that she gets a lot out of it, even if it’s not obvious in class. Besides, I can relate to wanting to hang back and observe. That’s what W- and I tend to do. I think things might be starting to change, though. A few months ago, she used to cry and ask to leave the drop-in centre as soon as we got there. Now she can usually play there until it closes. Last month, she started talking about the family support workers while we were at home, referring to them by name. During circle time this week, she didn’t sit on my lap, but on a stool that she brought over. I liked watching how intently she watched the family support worker and how she tried to quickly imitate the gestures, and I saw her mouth a few of the words too. She hid under the scarf or waved the scarf around as prompted. She flapped her part of the parachute up and down. She smiled great big smiles; she seemed happy that she was able to follow along. At music class, she got interested in helping put away things when I suggested that we play the excavator game. She liked holding the jingle bell sticks and the scarf (maybe because they triggered the “Mine!” instinct in her?). Once they were in her hands, she imitated the teacher and the other kids. She also returned them to the teacher. It helps to hold something or do something with her hands, I think. It probably helps a lot that A- likes the family support workers now. The family support workers serve snacks, answer my questions, and offer her things to play with. I’ve started bringing extra food to the drop-in centre to enable even more positive social interactions, too, and I think A- likes helping share yummy food with other people. She knows the music teacher’s name, but she doesn’t have as varied positive interactions with her. I’m looking forward to seeing how she’ll respond to music time and circle time next week. Maybe she’ll stay close, and maybe she’ll venture out a little more. While it might seem faster to push her into independence by not picking her up as much, I like watching her gradually feel comfortable enough to participate. I like how sometimes all she needs is a quick reconnection and then she’s off to explore. I like how she clearly feels secure enough in music class to listen and learn, and how much she remembers, and how she enjoys singing. She’ll have enough opportunities to practise independence without being pushed into it. She’s driven to grow. I’ve signed up for music classes until April, except for July and August. We’ll go to drop-in centres whenever we can, too. We’re both slowly getting the hang of things, and it’s wonderful. In the meantime, I’ll focus on picking up songs that I can sing to her throughout the day. We’ll practice imitation one-on-one. We’ll bring in babysitters so that she can have lots of positive interactions with people who are not me while staying in a familiar environment. We’re experimenting with going at her pace as much as possible while giving her plenty of opportunities to stretch and grow. She’s wonderful, and I have full confidence that she’ll get the hang of this. have small, consistent classes with a narrow age range and the same teacher: This is one of the benefits of a registered program. A- seems to warm up faster in a small group with familiar faces, and she’s gotten to the point of feeling comfortable walking around with me during the movement section. A narrow age range also makes it easier for the teacher to pick developmentally appropriate activities. are longer: Circle time is generally fifteen minutes long, compared to about 35 minutes of music time (excluding the 10-minute free play to help the kids settle into the side). have more planned variety over time: Because it’s a registered program, sessions can build on previous ones to cover topics systematically. Repetition within sessions and across sessions allows the introduction of uncommon songs. expose kids to good instruments: Small classes and good funding mean that every kid can try the same instrument, and they can go through different instruments over time. expose kids to professional performances: The kids can watch the teacher perform on various instruments at a level much higher than I can do at home or that I’ve heard at circle time. There’s a baby grand piano in the room, and the teacher plays that and other instruments as well. lead into other classes: There’s a clear path for life-long learning. It’s awesome watching A- learn. She’s beginning to anticipate the phrases in the bouncing rhymes, although she’s still pretty blasé about tickling rhymes. She walks around with me during the segment where everyone walks around in a circle. She picks up the pace a little when the tempo shifts. She sways and bounces to rhythms. She imitates how we play jingle bells, drums, rhythm sticks, and shakers. She sits down and stands up at the appropriate times in Ring Around the Rosies. I’m learning a lot, too. I’ve picked up a couple of new folk songs and rhymes. It’s a good opportunity to observe and learn a little about the ideas behind early music education, and it’s great to be able to ask questions. The textbook that the teacher recommended (Move, Sing, Listen, Play) will help me reinforce the ideas when we’re at home. I like the classes, and I’ve signed up for more next month and the fall term. I’m not here to push A- to be some kind of musical prodigy. I’d like us to have fun with music – to nurture our musicality. I’d like her to grow up knowing that music isn’t just something you listen to, but something that you can enjoy creating. Not just something you play, but something you can play with. Since the best way of doing that would be for her to “catch” that kind of enjoyment from me, I’m happy to take advantage of group classes where kids need to be accompanied by grown-ups. At this age, the classes are probably more for us anyway. Independent classes start at three years old, so I may as well make the most of our shared music education opportunities. We learned a bit about the ideas behind the Smart Start program when we went to the conservatory’s open house last weekend. Dr. Sean Hutchins (a neuroscientist, the RCM director of research) talked about how the Smart Start program focuses on developing attention, memory, perception, and cognitive flexibility, and shared some results from their neuroscience lab that showed significant improvements in musical ability and related areas such as literacy and numeracy. I asked him how his research influenced how he helped his kids with their music education. He told me about the value of starting early, and how music and movement are inextricably linked for young kids. I also asked him if the lab had developed any observation tools that parents could use to keep track of their kids’ musical development over time, outside the lab. (I’m a data geek, after all!) The lab has a short questionnaire for parents, but he didn’t have an inventory or scale that I might be able to use to document A-‘s growth. Ah well, I’ll just have to read textbooks on music education and take qualitative notes. The RCM Science blog and Resources page might be good starting points for more information. He also recommended Dr. Laurel Trainor’s work, as she does a lot of research with infants and toddlers. Anyway, the drop-ins are great for adding more music and socialisation to everyday life, so we’ll keep going to those ones too. Music classes seem to be a good use of our resources. I’m glad we get to do both! inventing all sorts of dance sequences on the fly. Random Japanese sentence: ÃƒÂ¦Ã‚ÂÃ‚Â‘ÃƒÂ¤Ã‚ÂºÃ‚ÂºÃƒÂ£Ã‚ÂÃ‚ÂŸÃƒÂ£Ã‚ÂÃ‚Â¡ÃƒÂ£Ã‚ÂÃ‚Â¯ÃƒÂ§Ã‚ÂšÃ‚Â†ÃƒÂ£Ã‚Â€Ã‚ÂÃƒÂ¨Ã‚Â¡Ã‚ÂŒÃƒÂ¦Ã‚Â–Ã‚Â¹ÃƒÂ¤Ã‚Â¸Ã‚ÂÃƒÂ¦Ã‚Â˜Ã‚ÂŽÃƒÂ£Ã‚ÂÃ‚Â«ÃƒÂ£Ã‚ÂÃ‚ÂªÃƒÂ£Ã‚ÂÃ‚Â£ÃƒÂ£Ã‚ÂÃ‚ÂŸÃƒÂ§Ã‚ÂŒÃ‚Â«ÃƒÂ£Ã‚Â‚Ã‚Â’ÃƒÂ¦Ã‚ÂŽÃ‚Â¢ÃƒÂ£Ã‚ÂÃ‚Â™ÃƒÂ£Ã‚ÂÃ‚ÂŸÃƒÂ£Ã‚Â‚Ã‚ÂÃƒÂ£Ã‚ÂÃ‚Â«ÃƒÂ¥Ã‚Â±Ã‚Â±ÃƒÂ£Ã‚ÂÃ‚Â®ÃƒÂ¤Ã‚Â¸Ã‚Â­ÃƒÂ£Ã‚ÂÃ‚Â¸ÃƒÂ£Ã‚ÂÃ‚Â§ÃƒÂ£Ã‚ÂÃ‚Â‹ÃƒÂ£Ã‚ÂÃ‚Â‘ÃƒÂ£Ã‚ÂÃ‚ÂŸÃƒÂ£Ã‚Â€Ã‚Â‚	All the villagers went out into the hills to look for a missing cat. Oh, and she sang Nearness of You—one of my favorite songs.